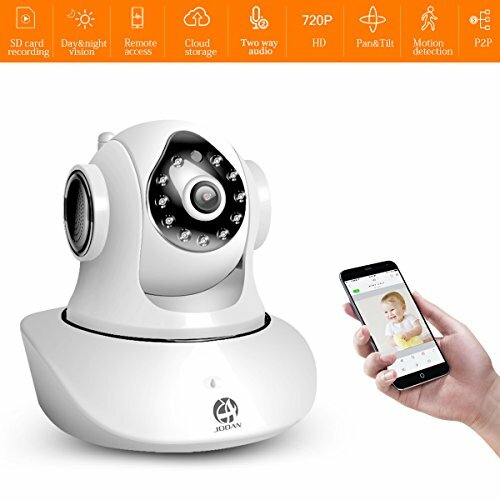 WiFi camera Easy Installation: Power on,download Danale APP, easy to setup and operate with its user-friendly APP Danale . Network access and live view via smart phone (iPhone & Android). For success wifi connection, please note that the device doesn't support 5G wifi, hot wifi, and wifi named with some special characters. ATTEN:ONLY SUPPORTS 2.4G WIFI;Built-in speaker and microphone,support two-way Audio and wifi brand:802.11b/g/n 2.4Ghz (5Ghz currently not supported) Wi-Fi band. Resolution: 1280x720. With 11 PCS infrared built-in IR-cut LEDs that enable you view up to 32 feet in darkness under night vision mode. Super Security: Provide secure, no worry streaming experience. Nobody can access to your device except for you.But you can share the wonderful moments with your friends. A push-to-talk button and built-in microphone let you communicate with kids, elderly family members, and even pets when you're out and about. If you have any questions about this product by JOOAN, contact us by completing and submitting the form below. If you are looking for a specif part number, please include it with your message.